Categories: Barrel Clocks, Holiday Specials. Tenth Barrel configuration with compass rose central carving and full roman clock dial with your personalized text carved & painted as shown in our new-style finish. This 24″ diameter, 4.5″ deep wine barrel clock is in our flagship “tenth barrel” configuration made from the end of an authentic retired wine barrel. 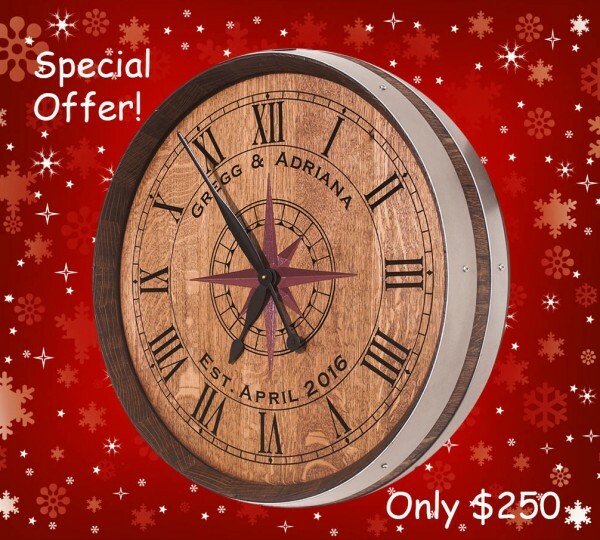 It has a carved and painted compass rose central carving and full roman clock dial, with your personalized text carved and painted, finished in your choice of stain color. It includes heavy duty flush-mount hangers on the back for easy wall mounting. Large compass rose design beautifully carved and painted with your personalized text and a full roman numeral clock dial elegantly V-carved and painted. Highest quality quartz clock movement and traditional hands. Customize with your choice of stain color & hoop finish, and text, font & color. You can elect to have us email you a design proof for your approval before final production. See DESCRIPTION tab below for more info. Central grape cluster beautifully carved in 3D relief with your personalized text and a full roman numeral clock dial elegantly V-carved and painted. Highest quality quartz clock movement and traditional hands. Customize with your choice of stain color & hoop finish, and text, font & color. You can elect to have us email you a design proof for your approval before final production. See DESCRIPTION tab below for more info. From $230. $345 with options shown. Customize yours below. Then either buy it now, or request your free photo-realistic design proof. This example of a winery logo'd barrel clock is shown in our biggest and best "tenth barrel" configuration, with full painted Roman Numeral dial, hand painted winery logo, and no personalized text. 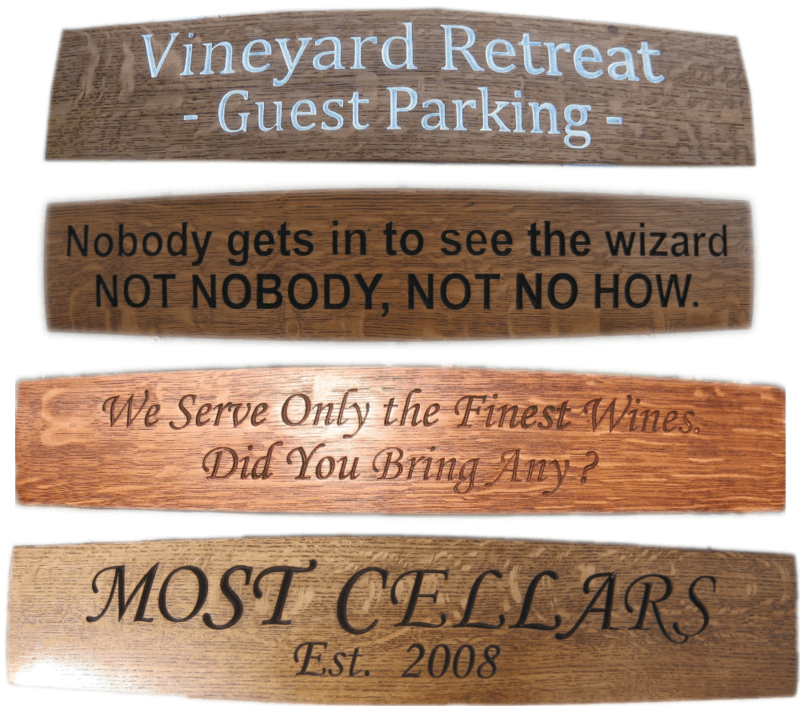 Notice that we enlarge the central carving to fill the space when no personalized text is desired. 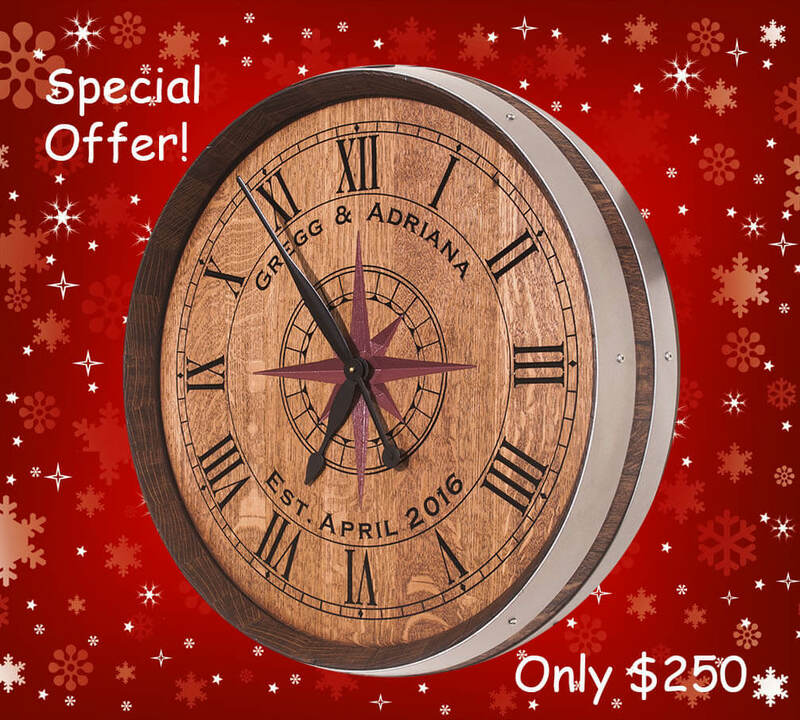 Customize your own with your choice of dial, logo or other 2d graphic central carving (optionally hand painted), personalized text in your choice of fonts, all finished in your choice of stain colors and finish styles. See Product Description tab at bottom for more info. The perfect piece of "wine decor" for your home bar, tasting room, or cellar, and makes an ideal gift for the wine lover. This beautiful, high-quality Sixteenth Barrel Clock is an 18” diameter, ~2” deep barrel head with a roman numeral dial and a wine bottle and glasses in the center. 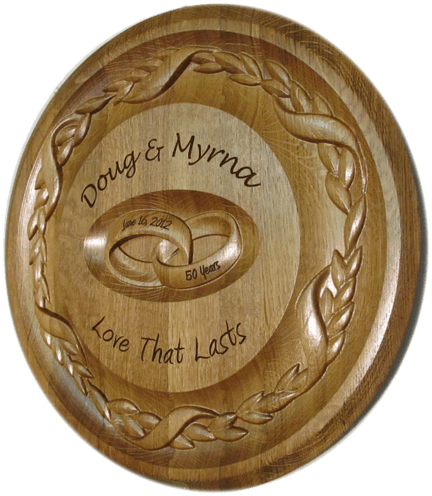 These elements are carved and painted - not burned-in, stamped-on, or screen-printed like less authentic products – then hand sanded, finished with red oak stain, distressed/antiqued and lacquered for a fine-furniture grade finish. 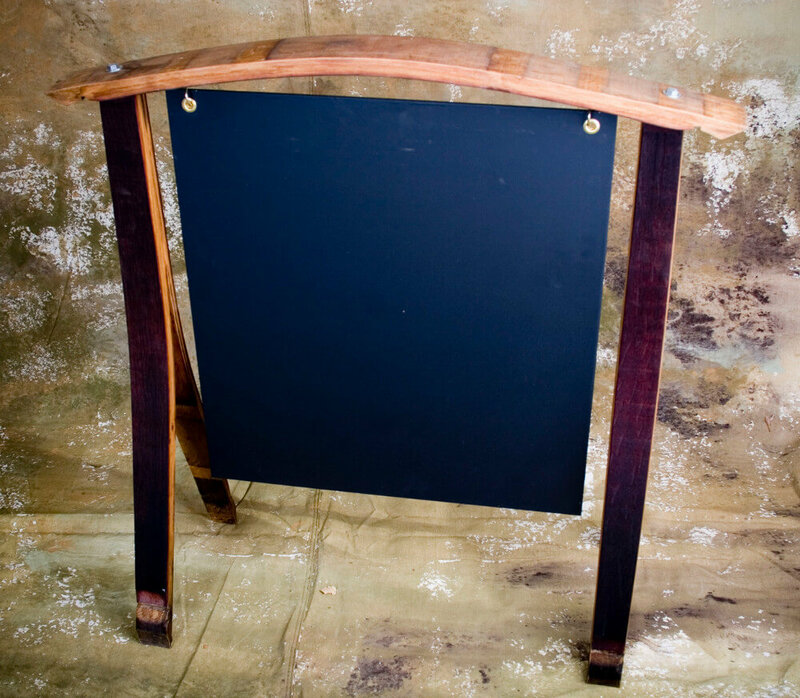 They are hand made in the USA with the same high quality standards as our products made from real barrels. The riveted steel hoop and beveled oak side staves are just like those in authentic barrels, while the head is oak veneer plywood. Unlike artificial looking flat-sawn oak, this quarter-sawn oak head is comprised of ~4” wide “stiches” to look just like real barrels. The clock is powered by a high-quality quartz movement accurate to one second per month, and runs for months on a single AA battery. The hour and minute hands are the classic black spade design. The clock is equipped with a saw tooth hanger on the back for easy wall mounting. From $260. $360 with options shown. Customize yours below. Then either buy it now, or request your free photo-realistic design proof. This example of our spectacular game room barrel clock is shown in our biggest and best "tenth barrel" configuration, with the King of Spades face card and personalized text. 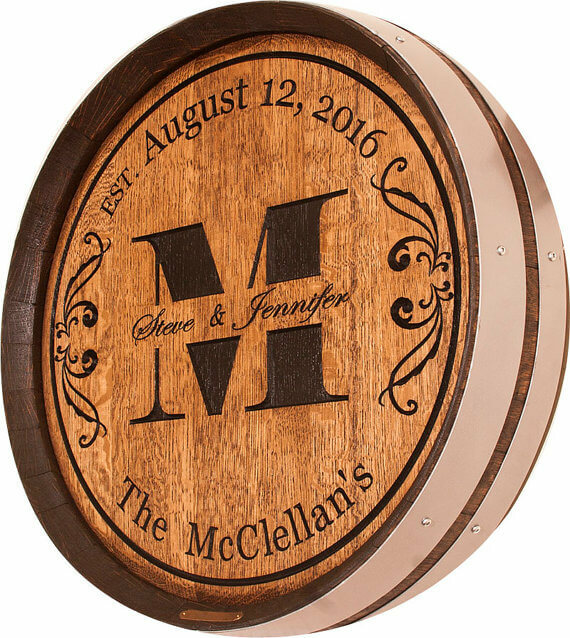 Customize with your own choice of face card, personalized text in your choice of fonts, all finished in your choice of stain color and finish style. See Product Description tab at bottom for more info. Price from $230. $360 with options shown. Customize yours below. Then either buy it now, or request your free photo-realistic design proof. This example of our western ranch style barrel head wall clock is shown in our biggest and best "tenth barrel" configuration, with full Roman numeral clock dial, 3d mare and foal carving, personalized text, and painted clock dial and text. Customize your own wine barrel head oversized wall clock with your choice of clock dial, central 3d relief carvings, or your ranch brand or logo, (optionally hand painted), personalized text, all finished in your choice of stain colors and finish styles. From $230. $345 with options shown. Customize yours below. Then either buy it now, or request your free photo-realistic design proof. 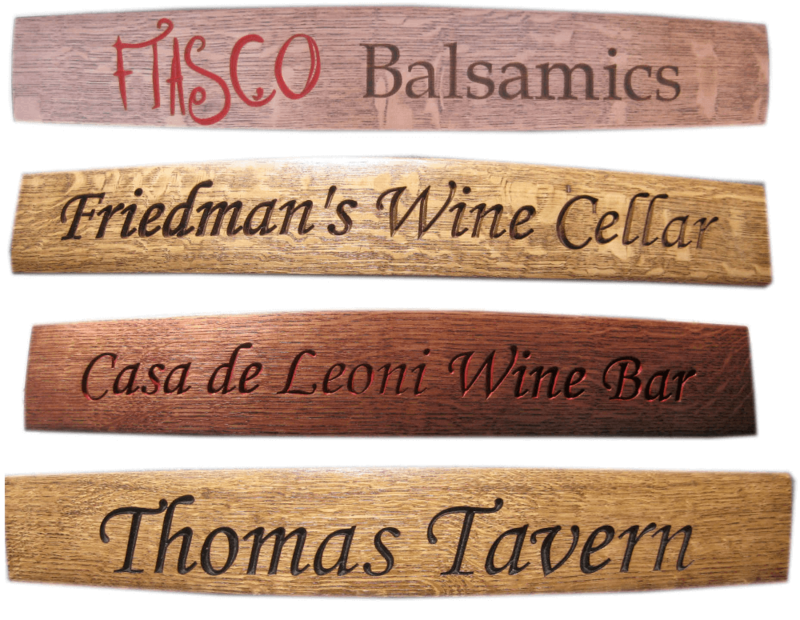 This example of a home wine cellar and bar barrel clock is shown in our biggest and best "tenth barrel" configuration, with full Roman Numeral dial, 3d grape cluster, personalized text, and painted dial and text. Customize your own barrel head oversized wall clock with your choice of a full Roman or Arabic carved dial, your choice of stunning 3-dimensional or 2-dimensional central carvings (optionally hand painted), personalized text in your choice of fonts, all finished in your choice of stain colors and finish styles. A unique wall clock perfect for any home wine cellar or home bar.